While this tutorial was written using Adaptive Menu Magic as its model, the techniques you will learn are applicable to any menu system or widget. The technology is wonderfully simple. You place a directive in your page where you want the contents of an external file (the include file) to be inserted. When your server encounters the directive, it reads the external include file and inserts its contents in place of the directive. Includes are often more practical to use for medium-to-large sites because only the include file needs to be edited and uploaded to your server. Each page that contains a directive that references the include file is then updated instantly. What does your server support? Does my server support ASP, PHP, or ColdFusion? Does my server support classic SSI? Which file extensions do you allow for SSI? To use classic SSI, your pages will need to use an .shtm or .shtml file extension instead of .htm or .html. If you prefer to keep your existing .htm or .html extensions, and you have access to your server's configuration (or ability to use .htaccess files), you can set your server to parse for these normal file extensions. See Addendum at the end of this tutorial. Your include files (the external files that contain the content to be included in your page) can use any file extension that Dreamweaver supports - no matter which type of include you are employing. We recommend using the .htm file extension. That way, Dreamweaver will allow you to edit your include file in Design View. To use PHP includes your host pages will need to use the .php file extension. To use ASP includes your host pages will need to use the .asp file extension or the .aspx extension if you are using .NET. To use ColdFusion includes your host pages will need to use the .cfm file extension. If you have full access to your server's configuration you can set it to parse includes for normal web file extensions such as .htm and .html types. See Addendum at the end of this tutorial. Of course, the root ID and class can be slightly different as they depend on the how many menus are on your page, and the options and attributes being used. Dreamweaver can be set to display server-side includes in Design View. Note: Depending on the version of Dreamweaver you are using, your Preferences window might look slightly different. The include file is the external file that contains the information that you wish to include in your actual web pages. You'll create a new folder, an include file inside that folder, and then you'll copy the menu markup from an existing web page and copy it into the new include file. -Create a new folder inside the root of your defined Dreamweaver site. -Name the new folder includes. -Create a new file within the includes folder and name it AMM_include.htm. -Open the page that contains your actual menu. For this tutorial, we'll assume that this page is index.htm. For your include to work on your server, you'll need to change your file extension so that index.htm becomes index.shtm. -Open index.htm (the page that contains your menu). -Choose File > Save As. -For File name, type in index.shtm. Note: The file extension depends on your server capabilities and could be .shtm, .shtml, .php, .asp, .aspx, or .cfm. -Find the menu markup (it begins with <div id="p7AMM_1") and place your cursor anywhere inside the menu code. Note: The Tag Selector bar behaves differently in various Dreamweaver versions. Older versions might show the entire DIV tag, along with its IDs and classes, directly on the bar. Newer versions will show a tooltip when you hover over the element. -Find <div#p7AMM_...> on the Tag Selector bar, which runs along the bottom edge of Dreamweaver's window (just above the Property Inspector) and click to select it. Depending on your chosen menu options, what appears on your Tag Selector bar might be a little different. The entire block of menu code will highlight to indicate your selection. Include files must only contain the code you wish to appear in your actual web page. Your page contains a DOCTYPE, an <html> tag, a <head> region and a <body> tag. You will remove all of this code and replace it with the menu markup you copied from your actual page. Your menu markup replaces the original code. When viewed on the internet, your server will insert the contents of your include file into your actual web pages. In all likelihood, your pages will reside in various folders within your site. If you use Document Relative paths (Dreamweaver's default), then your menu item links will always be relative to your include file, which is in its own folder. Your links will not work unless the page happens to reside in the includes folder. The only way to ensure that your links are always going to work, no matter what the page, you must set them to be relative to the root of your site. -In AMM_include.htm, click the AMM icon to open the AMM interface. -The Select File To Link dialog will open. -In the Relative to list, choose Site Root. The URL value will change to include a leading forward slash, which indicates the path to your linked file is now relative to the root of your site. -Click OK to close the Select File To Link dialog. The Link URL box in the AMM UI will reflect your new link and its site root relative path. -Repeat the above steps to change all of the links in your menu to site root relative. -Click OK to close the AMM UI when you're done converting all of your links. -Select all of the code that comes before the <div id="p7AMM_"... tag. -Find the menu markup (it begins with<div id="p7AMM_"...) and place your cursor anywhere inside the menu code. -Find the menu DIV on the Tag Selector bar and click to select it. The entire block of menu code will highlight to indicate your selection. -Press your Delete key to delete the markup. -Dreamweaver 8, CS3, CS4, CS5, CS5.5, and CS6 users choose Insert > Server-Side Include. -MX 2004 users choose Insert > HTML > Script Objects > Server-Side Include. -MX users choose Insert > Script Objects > Server-Side Include. The Select File dialog will open. -Dreamweaver will insert a Virtual Include comment in your code. Dreamweaver CC users please copy the line of code below and paste it into your page to replace the menu code. -Click the folder icon to browse to and reset the path to your include file. -Select Site Root from the Relative to list. Your Filename path now has a leading forward slash indicating it is Site Root Relative. Your menu will be there. If it is not, make sure you followed the instructions to set your Dreamweaver Preferences to show Include files. 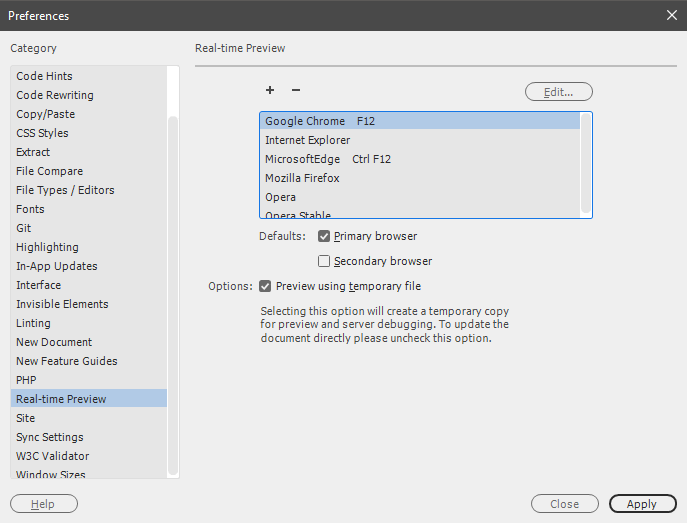 -Check the Options box to Preview using temporary file. Note: Dreamweaver can only generate the included content for the current page. If you click a link on the previewed page and open another page, the include will not be rendered. This is normal behavior for Dreamweaver. All pages will work as expected on the internet. The Meta tag line will be present if your AMM menu is set to "Enable Responsive Conversion". To create additional pages, make copies of index.shtm and rename the copies. -When the Save As dialog opens, change the name in the File Name box. For example, change index.shtm to products.shtm. Note: If you are using a Dreamweaver Template, you can insert an include into the DWT file. Just remember that all of the pages attached to your Template will need to be changed to the shtm file extension. Your include file extension (AMM_include.htm) does not need to be modified unless the include file will be containing dynamic server code. Older servers might require different syntax. If you have problems, contact your server admin or host support. The following addenda cover customized settings to enable parsing of htm and html file types. The first addendum covers Windows Server and the second addendum covers Linux/Apache/Red Hat servers. When page content is called via SSI directive tags in HTML pages, the server has to parse (look through) these pages trying to find SSI directives. In the past, when servers were running on 386 and 486 machines, this often bogged down a server by forcing it to parse every HTML file it serves up looking for SSI directives. Modern servers should not be affected at all. Web servers typically only look through certain HTML files. These files are identified by their extensions. By default, IIS will only parse HTML files that have .shtm, .shtml, and .stm extensions. This can pose a problem if you want to start adding SSI directive tags to long-established pages. These pages may have the more traditional extensions of .htm and .html and through time could be linked to by numerous other sites and indexed with their current extensions by various search engines. Changing the extensions to accommodate server parsing would cause a raft of 404 errors when people try to access these pages from existing links and search engine references. Simply duplicate the mapping properties you noted in the previous step but this time enter .htm in the Extension field and click on OK. The default file extension for CGI scripts under IIS is .pl so if you have a bunch of CGI scripts with a .cgi extension, you can use the above procedure to add a mapping to the Perl.exe file for the .cgi extension. Simply duplicate the mapping for the .pl extension. That's all there is to it. It's probably a good idea to restart the server, or at least the IIS service in the Control Panel, so that all your changes take effect. If you have access to your server or to your web directory's htaccess file, you can leave your web pages as index.htm or page.html and have your includes parsed just as if they were placed in an index.php or page.php file! Go to your WWW root and look for the file named .htaccess. If it's not there ask your host or server administrator where to find it and if you may edit it. Once you have the correct method to deploy from your host, save the file and upload it to the root of your site. Save and close the .htaccess file. Upload it to your web server and you're done. Adaptive Menu Magic was designed to make it as easy as possible for you to work with site management techniques such as Includes. Even after deploying an include, you can still use the AMM User Interface to add or delete links, add sub-menus, re-order your menu items - in short, you do not give up the power of the AMM UI when you use server-side includes!